This beautiful Florida waterway designer-vacation rental home is LOCATED 5 minutes by car 15 minutes by cycle (we have 5) from Marco’s 5 mike powder pink sand beach - RATED NO. 1 IN THE USA BY TRIP ADVISER. JUNE 2011 LUXURY RENOVATION : This beautifully situated property has been completely renovated from the ground up. The family and living rooms have been opened up to create a large expanse with cathedral ceilings up to 17 feet high. The western side of the property features a continuous 40 foot expanse of state of the art sliding doors and windows 8 feet high, overlooking Landmark Bay and offering the best views in Marco. The kitchen and wet bar areas have custom beech cabinetry with state of the art appliances, including a Miele induction cook top, Miele oven with Master Chef programmable cooking, Miele glass aluminium hood, Kitchen Aid Dual French Door Refrigerator, with a separate refrigerator in the laundry room for drinks and ice, U-line 43 bottle dual zone wine cooler, De Longhi espresso/cappuccino maker and numerous small appliances. This is our winter home. We live in Europe on another island. I am a US international tax lawyer and Petra is the Dutch mother of our 3 wonderful children and manages our properties. You can find plenty of 3 BR villas on Marco Island for several hundred dollars less and some higher end properties for thousands more. But you won't find any as luxuriously decorated as this and with these views for anything near our prices. Your choice will determine whether you have the memorable vacation of a lifetime. Aside from vacationing on the top rated island in America, you will be in one of the few places left in the world where you can commune with vast, untouched nature as it was, and always is, here, on the border of civilization. Perfect family property with everything you could need. 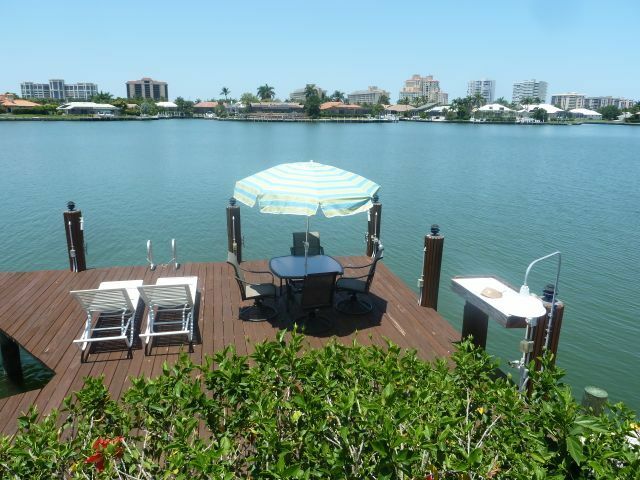 We were lucky enough to spend a holiday at this amazing Villa, very close to the beach in Marco Island. It is immaculately clean throughout and all of the bedrooms are of a good size. The area is very quiet and you have the most stunning views of the evening Sunsets as the house faces West towards the beach. The kitchen is very well stocked with every cooking utensil and all of the pans you could ever need. We even found time to discover Marco Island using the bicycles in the garage, they all have helmets as well, so everything is ready for you. I would not hesitate to recommend this property for a holiday. It really does have the Wow factor when you walk in through the door and the pictures do not do it justice. Especially the master ensuite, which is quite huge and has a walk in wardrobe. It was our pleasure to have you as guests. My Dutch wife Petra deserves all the credit for the design and maintenance of this property to her own perfectionistic standards. Second time there. Loved it 😊� Clean, perfect location, has everything you could possibly want including bikes. Thanks for the use of your home! This is our second time at this house and absolutely love it! The house has everything you need plus extremely clean. Beautiful home on a Beautiful Island! Marco Island is a beautiful place to vacation and the house we rented was absolutely stunning! The views from the back of the house were amazing. The only thing you need to bring is your own groceries. The owners were very easy to communicate with and answered all our questions. Pack your suitcases and enjoy! You will have everything else you need in this beautiful home! Thank you for your kind review, and it always lovely to hear our guests enjoying the home. pristine, upmarket community with no billboards or fast food signs. and day and night chartered catamaran cruises. dock, ospreys nesting atop buoys, dolphins in the waterways and the beach is home to abundant sea life and birds. The year around average temperature is 77 degrees (25.5 C), rarely exceeding 87 degrees (30 C) even in the summer and cooled by ocean breezes. 2 or 3 marinas on the island rent boats.